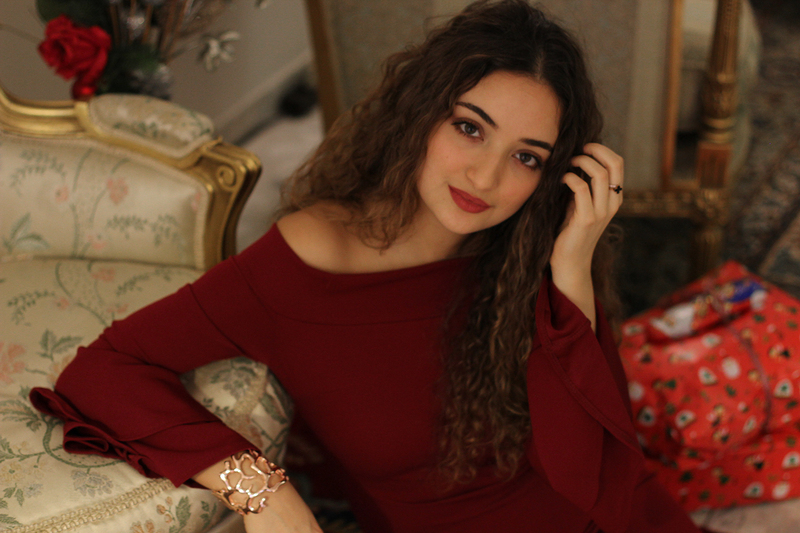 Day three of Mercedes Benz Fashionweek Berlin has arrived and I had made one major learning from the two days before – Don’t wear light clothes when it’s freezing outside only because you want to look good. And who said you cannot wear something warm & stylish at the same time? Well yes, it’s not impossible but it’s also not that easy. The purpose of warm clothes is functional; they are primarily not supposed to be stylish. This obviously is not always the case but most of the time it certainly is. 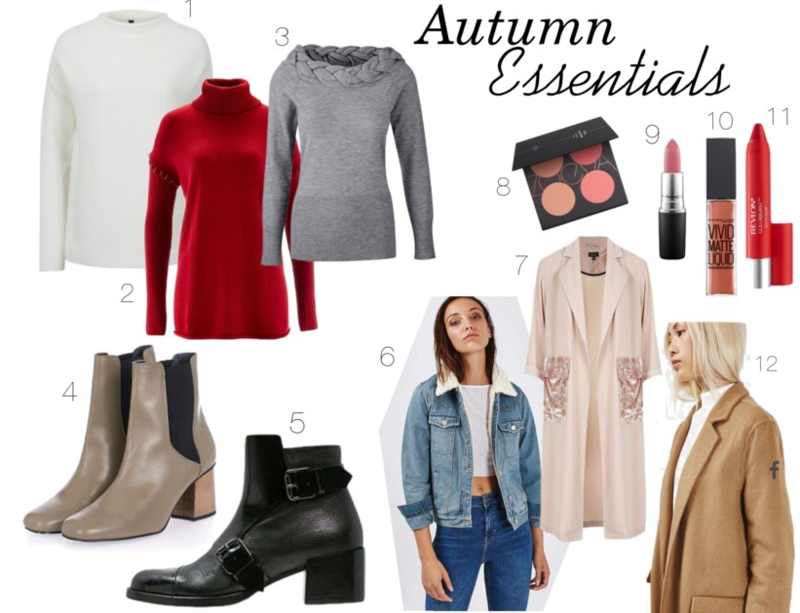 Anyway, on day three I grabbed the prettiest warm stuff I have and simply started layering. Despite ripped jeans, I must say that this warm & stylish outfit felt like heaven compared to my other two looks the days before. I felt like I could resist Siberian winters, haha. So, what was on my plan on day three? Networking, networking, networking! I used the day in order to go to a couple of blogger events like the Hashmag Blogger Lounge or the Leck mich am Hashtag Blogger Brunch, where I got in contact with so many nice colleagues plus I was provided with good fooooood. Other than that, I went to the Panorama Trade Show and had a look at the designers’ new collections. By the way, those trade shows are also the perfect opportunity for bloggers to find new potential collaboration partners. So, for all of you bloggers, I can only recommend visiting those trade shows. I ended the day with a nice dinner with some friends at an Asian restaurant and went to bed at like 10pm. Fashionweek can be pretty exhausting… especially when it’s cold… brrr…. but it was also so much fun and exciting – can’t wait for my next Fashionweek! It’s that time of the year again. We fight the darkness with colourful lights and give back to the ones we love, warming up the atmosphere and our hearts. Well, that is what they say. Reality always looks different, but don’t let me be the pessimistic one here – in every saying is always some truth. You cannot deny that Christmas time … is different! People do more good, give to charity and spend more time with their families. And this is reality. The whole gifting stress is just like noise, it’s irrelevant in the end. While many people think it’s hypocrite that people suddenly become “good” during the Christmas holidays by arguing that we actually should aways be like that, I think that this sudden behavioral change is better than nothing. We get so soaked up in our daily lives that we loose perspective on the important things. Are we to blame for that? I don’t know. All I know is that if we can break free from that, at least once per year for a couple of days, it is better than nothing. This is what Christmas really means to me. It’s a little wake-up call. Some time for reflection. A complete shuffle of priorities. For some this phase only lasts for the holidays, for others it might extend even longer. And yea, the longer the better. But falling back into old habits is just human. So my Christmas holidays are probably exactly that. Plus, of course a little bit of party and turning off the overthinking mode. I havent quite figured out what I will wear yet, but this glittery top from Desigual or the red dress I’m wearing on the pictures… I’ll see! When I chose Sydney for my semester abroad, I knew that living there was going to be extremely expensive. Australians are pretty much used to it, especially because they also earn higher salaries accordingly. However, as an international student, you know that you will end up super broke by the end of the semester. So, with weekly rents that added up to almost twice the rent I paid back in Maastricht and limited time to cook a cheap meal at home, it was clear that I had to cut costs on other things. Luckily, there are plenty of activities to do in Sydney that are for free. Most of them are outdoors, but with an annual average of 236 sunny days a year, one does not really have to worry about the weather anyway. Here are five low-budget things to do in Sydney, that will only cost you the transportation to get there. 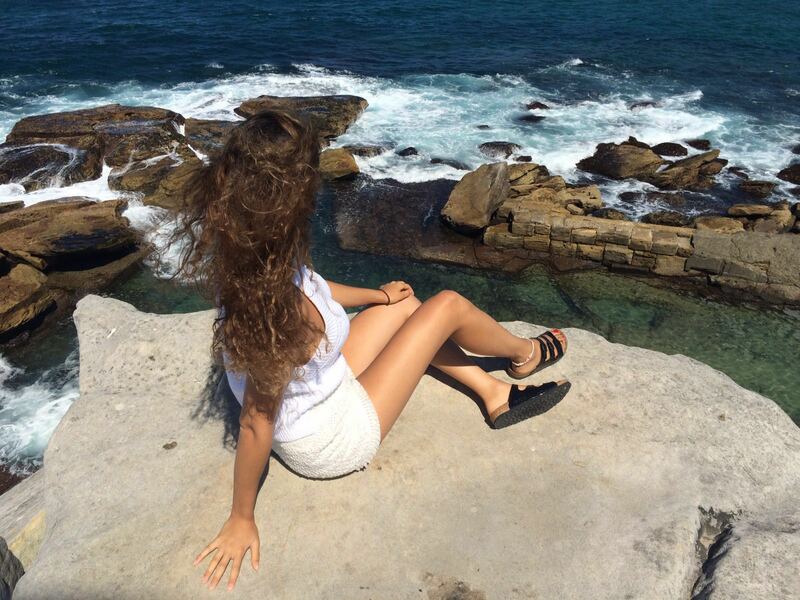 Want to explore Sydney’s beaches? Well then the Coogee to Bondi walk is the right thing for you. It is a pretty easy route of about 5km that is also ideal for jogging or running. My recommendation – grab a nice and fresh Smoothie at Calipress Juice at Coogee and then start walking along the beautiful coastal line, passing by Coogee, Clovelly, Bronte, Tamarama and Bondi Beach. Beyond the lovely beaches and cliffs, you will also get to see cool surfers (or maybe try out surfing yourself! 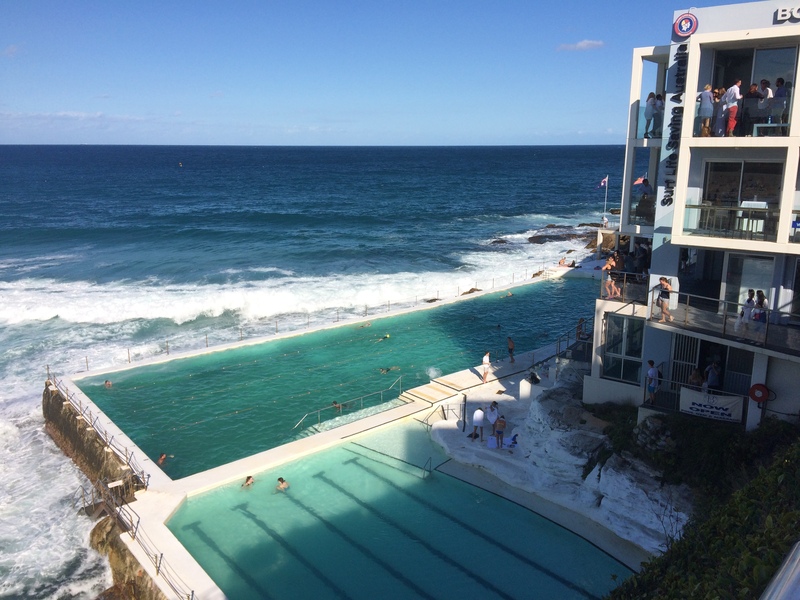 ), the old Victorian Waverly Cemetery, the Bondi Ice Berg Pools and many other things. Furthermore, it offers plenty of opportunities for sports, like the outdoor gyms, surfing, kayaking, snorkling and other things. 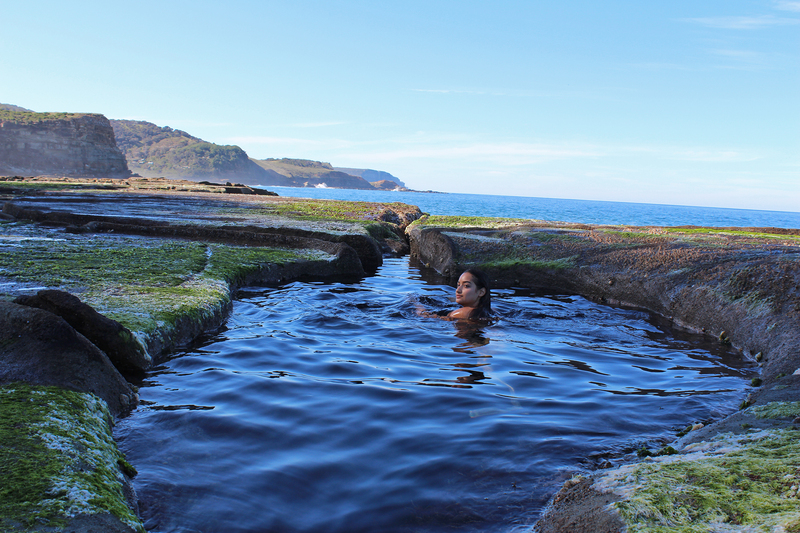 Only 1,5 hours by train from central Sydney you can reach the Royal National Park. It covers an area of 15k hectare and is supposed to be the oldest purposed national park. Since it’s so huge, there are so many things to discover and sooo many hikes to do. However, what we were after were the famous Figure Eight Pools! Recently extremely trending on Instagram, getting there is not too easy. Once you are there though, the view is simply amazing – one of the most beautiful places I have ever seen. You need to be careful, however, and check the tides before you go there. You will only be able to see the pools during low tides. Once the tides are starting to get higher, make sure to quickly get away, since the strong waves will hit the rocks and seriously injure you. 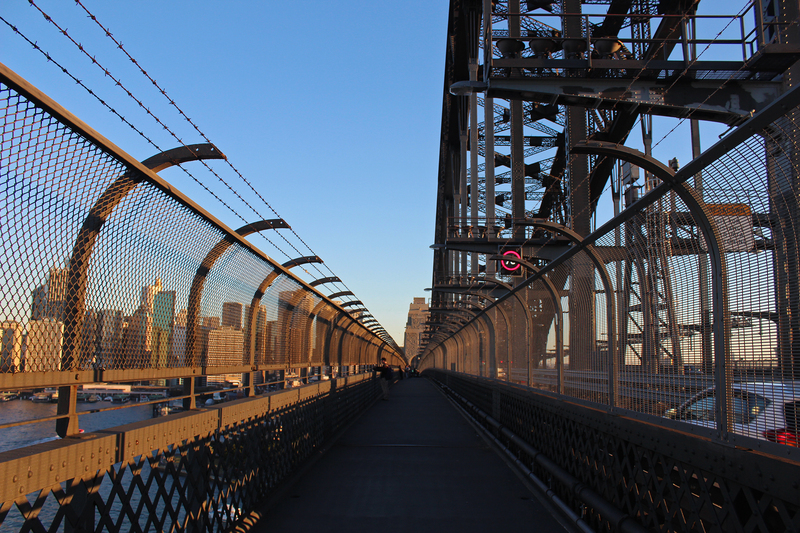 You could pay over $300 to climb over the Harbour Bridge … or you can simply walk over it for free. 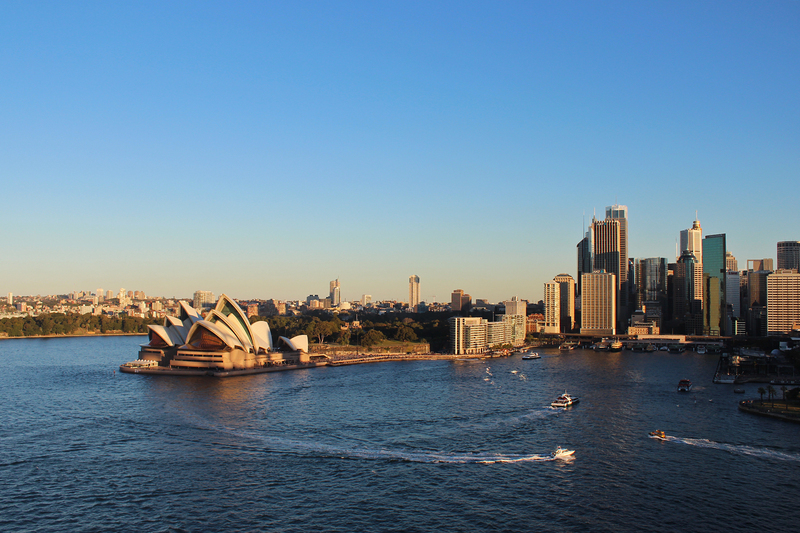 You will get an amazing view and see the Opera house and the Sydney Skyline from a unique angle. My recommendation is to do it around sunset time and in that way enjoy the beautiful lights and colors in the sky reflecting on the city. 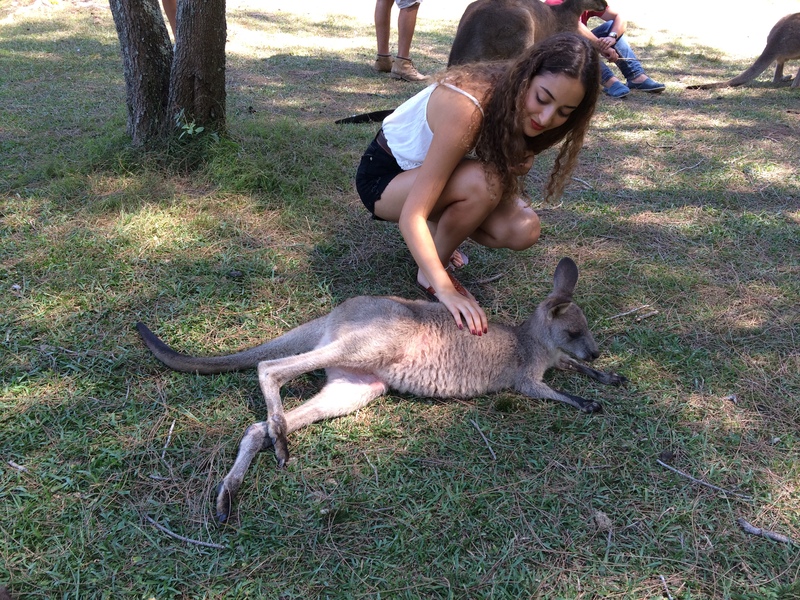 The kangaroo picture is basically obligatory when going to Australia! So, instead of paying to get to the Zoo and see kangaroos through a window, you can simply take the train to Morisset and experience these cute animals in their natural habitat. Make sure to buy some bananas before you go, so you can feed them! Furthermore, I can assure you that they are super tame and you can pet them without being scared – no they will not box you. Just be nice to them, and they will be as cute as they look to you! 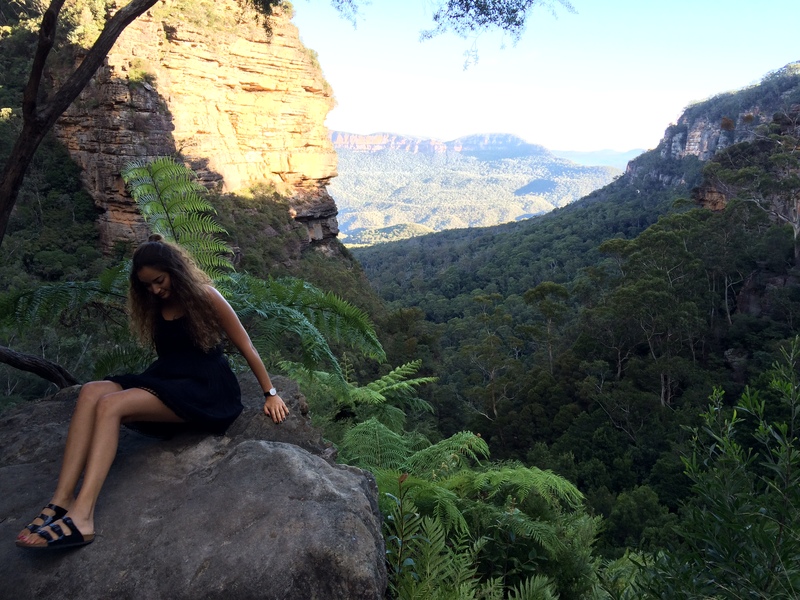 Another low-budget must-do in Sydney is going to the Blue Mountains! You can either go there for a day trip, or even spend a couple days there camping. Do not ask me why, but for some scientific reason, this mountainous area takes on a blue-greyish color when viewed from distance. The hikes there range from easy to extremely difficult and exhausting, so make sure to check the routes first before you start your hike. 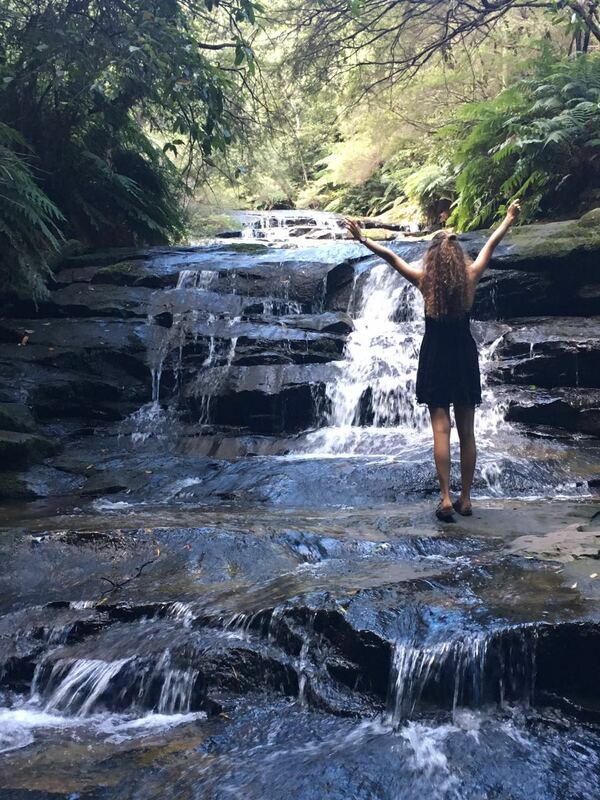 The Leura Cascades is one of the highlights which you should definitely check out as well, and fortunately getting there does not take a too hard walk!